This article does not conform to the Infosphere's quality standards. It will need to be expanded or cleaned up. You can help by editing. Religion appears in many episodes of Futurama, though they're all fictional, except for Vodou. This is the religion for fans of Star Trek. It has been suggested to move this section into its own article. See talk page for a discussion. Created from the merging of major 20th century religions - Christianity, Judaism, Islam, Hinduism and Buddhism as well as agnosticism. Led by Father Changstein El-Gamal. See Order of the Binary Singularity. Is a minor robot religion in Chapek 9 that worships call (Creatrix) Mom the founder of Order of the Binary Singularity. A mainstream religion, probably started by, or for, Oprah Winfrey. Over Christmas (suggesting they mutated before the second coming of Jesus) and Easter the Sewer Mutants gather in church to worship an unexploded nuclear bomb. 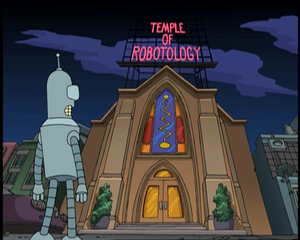 A religion whose members are exclusively robots, Robotology has many customs. Sinners will be collected by the Robot Devil to spend eternity in Robot Hell, New Jersey. The religious text of Robotology is The Good Book 3.0. Presumably a successor religion to Judaism. Little is known about the relations of Robot Judaism with other religions, but it is known that adherents of Robot Judaism believe that Robot Jesus was built and a very well programmed Robot, but not the Messiah. Followers are known to keep some level of kosher. Shellfish and pork may not be consumed (an anthropomophic pig and Zoidberg were denied entrance to a "Bot-Mitzvah"), though it is unknown if there are other dietary laws besides those mentioned. Keeping with Jewish practice, young Robots go through a rite of passage, which, instead of being called a "Bar" or "Bat Mitzvah", is the aptly named "Bot-Mitzvah". In "Xmas Time Is Fear", as a part of the armed forces, they collect weapons to give to the defenceless so they can be safe on Xmas Eve. However in "Robot Santa's Little Helpers", they behave much like they do in the 21st Century, except that they get donations at gunpoint. Led by the Space Pope. Nothing else known. Believe that God exists somewhere in the depths of space. Built a powerful radio telescope in the Himalayas to try and find him. Fry managed to reach a being similar to this, who then sent Bender back to Earth. The Monks have been searching for 700 years. Strictly non-violent. Vodou, the only non-fictional religion to appear in Futurama, has become a mainstream religion by the 31st century. This may have something to do with the increased number of zombies and may have been brought on by the birth of Zombie Jesus or popularized by the Chanukah Zombie. This religion originally started in West Africa and has spread throughout the world. This was created by Yivo and many humans joined it, led by Fry. The Order of the Binary Singularity seem to worship Mom as their creator deity and refer to her as the "Creatrix". They have her image engraved in their temple's stained glass windows. Info: Zombie Jesus appears to be a zombie version of Jesus who exists separate from the original and seems to have a very different and odd origin. He has not been seen in the series, but is often mentioned by The Professor. He is featured in The Story of Xmas in the comics. Unlike the original, he seems to have been born as a zombie, with the birth having taken place in the future and at his birth a fembot and an alien octopus were present. Quote - Fry: I feel like I was mauled by Jesus. Info: The standard Christian version of Jesus exists alongside (but separate from) the zombie and robot versions. People in the future know enough about him that they recognize Zoidberg's Jesus costume as such (and don't call him "Zombie Jesus"). The second coming of Jesus apparently took place in 2443 and for some unknown reason several video tapes were destroyed during the event. It is unclear what role the figure of Regular Jesus plays in modern religion, such as Space Catholicism and the First Amalgamated Church. 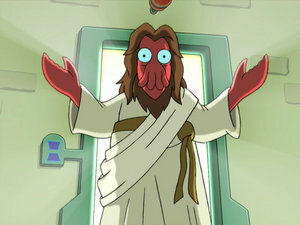 Quote - Zoidberg (as Jesus): [Running away] I help those who help themselves! Info: Apparently the central icon of religion in the sewers, and an obvious reference to Beneath the Planet of the Apes. Its followers are rather lax in their beliefs and mainly only worship on certain religious holidays (Christmas and Easter). 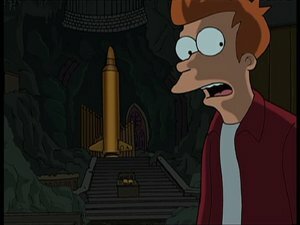 Quote Fry: Wow, you guys worship an unexploded nuclear bomb? Vyolet: It's mainly a christmas and easter thing. The origin of the universe is a big part of most religions. It seems that Nibblonians had already existed for 17 years before the universe was created. Nibbler explained the creation of the universe to Leela (it was not revealed to viewers) and she responded with "Then the meaning of existence-- [Nibbler acknowledges.] So every religion is wrong!" Xmas has lost all religious, and even popular, connotations since the 31st century. Everyone fears Robot Santa Claus. This page was last edited on 18 September 2017, at 02:13.